Maya Angelou—author, poet, playwright, stage and screen performer, and director—is best known for I Know Why the Caged Bird Sings (1970), the story of her early life, which recalls a young African American woman's discovery of her self-confidence. Maya Angelou was born Marguerite Johnson on April 4, 1928, in St. Louis, Missouri. After her parents' marriage ended, she and her brother, Bailey (who gave her the name "Maya"), were sent to rural Stamps, Arkansas, to live with their grandmother, who owned a general store. Although her grandmother helped her develop pride and self-confidence, Angelou was devastated when she was raped at the age of eight by her mother's boyfriend while on a visit to St. Louis. After she testified against the man, several of her uncles beat him to death. Believing that she had caused the man's death by speaking his name, Angelou refused to speak for approximately five years. She attended public schools in Arkansas and later California. While still in high school she became the first ever African American female streetcar conductor in San Francisco, California. She gave birth to a son at age sixteen. In 1950 she married Tosh Angelos, a Greek sailor, but the marriage lasted only a few years. Later Angelou studied dance and drama and went on to a career in theater. She appeared in Porgy and Bess, which gave performances in twenty-two countries. She also acted in several plays on and off Broadway, including Cabaret for Freedom, which she wrote with Godfrey Cambridge. During the early 1960s Angelou lived in Cairo, Egypt, where she was the associate editor of The Arab Observer. During this time she also contributed articles to The Ghanaian Times and was featured on the Ghanaian Broadcasting Corporation programming in Accra, Ghana. During the mid-1960s she became assistant administrator of the School of Music and Drama at the University of Ghana. She was the feature editor of the African Review in Accra from 1964 to 1966. After returning to the United States civil rights leader Dr. Martin Luther King, Jr. (1929–1968) requested she serve as northern coordinator for the Southern Christian Leadership Conference. I Know Why the Caged Bird Sings (1970), the first in a series of Angelou's autobiographical (telling the story of her own life) works, was a huge success. It describes Angelou's life up to age sixteen, providing a child's point of view about the confusing world of adults. The book concludes with Angelou having regained her self-esteem and caring for her newborn son. In addition to being a sharp account of an African American girl's coming of age, this work offers insights into the social and political climate of the 1930s. Her next autobiographical work, Gather Together in My Name (1974), covers the period immediately after the birth of her son Guy and describes her struggle to care for him as a single parent. Singin' and Swingin' and Gettin' Merry Like Christmas (1976) describes Angelou's experiences on the stage and concludes with her return from the international tour of Porgy and Bess. The Heart of A Woman (1981) shows the mature Angelou becoming more comfortable with her creativity and her success. All God's Children Need Traveling Shoes (1986) recalls her four-year stay in Ghana. Angelou wrote about other subjects as well, including a children's book entitled Kofi and His Magic (1996). Angelou had been writing poetry since before her novels became popular. Her collections include: Just Give Me A Cool Drink of Water 'Fore I Diiie (1971); Oh Pray My Wings Are Going to Fit Me Well (1975); And Still I Rise (1976), which was made into an Off-Broadway production in 1979; Shaker, Why Don't You Sing (1983); Life Doesn't Frighten Me, illustrated by celebrated New York artist Jean Michel Basquiat (1993); Soul Looks Back in Wonder (1994); and I Shall Not Be Moved (1997). Angelou's poetry, with its short lyrics and jazzy rhythms, is especially popular among young people, but her heavy use of short lines and her simple vocabulary has turned off several critics. Other reviewers, however, praise Angelou's poetry for discussing social and political issues that are important to African Americans. For example Angelou's poem "On the Pulse of the Morning," which she recited at the 1993 swearing in of President Bill Clinton (1946–), calls for a new national commitment to unity and social improvement. Angelou has received many awards for her work, including a nomination for National Book Award, 1970; a Pulitzer Prize nomination, 1972; a Tony Award nomination from the League of New York Theatres and Producers, 1973, for her performance in Look Away; a Tony Award nomination for best supporting actress, 1977, for Roots; and the North Carolina Award in Literature, 1987. In the 1970s she was appointed to the Bicentennial Commission by President Gerald Ford (1913–) and the National Commission on the Observance of International Women's Year by President Jimmy Carter (1924–). She was also named Woman of the Year in Communications by Ladies' Home Journal, 1976, and one of the top one hundred most influential women by Ladies' Home Journal, 1983. Angelou has also taught at several American colleges and universities, including the University of California at Los Angeles, the University of Kansas, Wichita State University, and California State University at Sacramento. 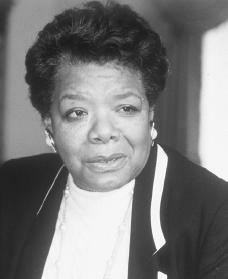 Angelou also worked in television as a writer-producer for 20th Century-Fox, from which her full-length feature film Sister, Sister received critical praise. In addition she wrote the screenplays Georgia, Georgia and All Day Long along with television scripts for Sister, Sister and the series premiere of Brewster Place. She wrote, produced, and hosted the National Educational Television series Blacks! Blues! Black! She also costarred in the motion picture How to Make an American Quilt in 1995. Angelou made her first attempt at film directing with the feature length movie Down in the Delta (1998). The film told the story of a seventy-year-old woman and her personal journey. Angelou found directing to be a much different experience from writing because with directing you have "ninety crew and the cast and the sets and lights and the sound." Although Angelou is dedicated to the art of autobiography—a sixth volume, A Song Flung Up to Heaven, was published in 2002—in her seventies she remains a force in several different fields. Since the early 1980s she has been Reynolds Professor and writer-in-residence at Wake Forest University. In the year 2000 she was honored by President Clinton with the National Medal of Arts, and in 2002 Hallmark introduced The Maya Angelou Life Mosaic Collection, a series of greeting cards containing her verse. She also has plans to write a cookbook and direct another feature film. Kite, L. Patricia. Maya Angelou. Minneapolis: Lerner Publications, 1999. Loos, Pamela. Maya Angelou. Philadelphia: Chelsea House, 2000. Shapiro, Miles. Maya Angelou. New York: Chelsea House, 1994. I love your're article . It's amazing. It's the best article i've ever read. Hello, my name is Alexus Bond. And this ratherly short paragraph about the lovely Maya Angelou was great. Because I'm in school right now and it gave me pleanty of information that I needed. Thank you so much! i just wanted to know if she did good things... and she did! I am doing a project and this article helped me get an A on it! I really knew hardly anything about her but thanks to this article I learned about hert and got a good grade. THANKS! Well I think this article was great but it didnt tell me about her family that much. hi ! I picked Maya as my famous authour for womens history month.I would like to send a special thank you to the authors of this article.I gave me such information on her !Thanks so much! good research infomation! they could have gave me more information and little more detail!